Had I read the reviews, I probably wouldn’t have chosen to see this sci-fi thriller about a scientist in New York City struggling to find an antidote for a cancer vaccine gone bad. But I love Will Smith, and I didn’t read the reviews. Therefore, I just spent 100 minutes gripping the edge of my seat in absolute terror as former Army scientist Dr. Robert Neville battles CGI humanoid monsters infected with a rabies-like disease. 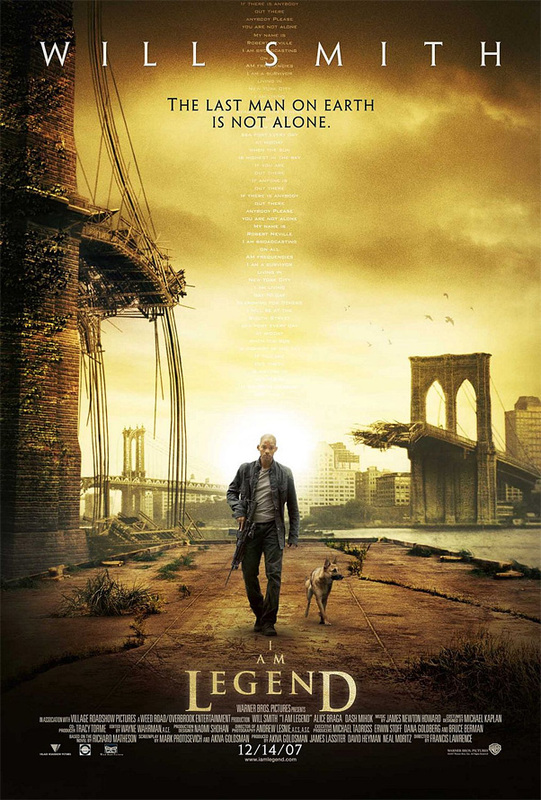 Neville, who believes he is the last human on earth after a cancer vaccine rapidly destroys the earth’s human inhabitants, wanders the almost jungle-like streets of NYC looking for “Dark Seekers” he can bring home to test his antidotes on. With his dog Samantha by his side, he hunts herds of deer–which are pretty ridiculous CGI renditions, visits his local DVD rental store, and sends out daily AM-radio messages looking for other survivors of this holocaust. While the special effects aren’t great–the CGI monsters and animals are fair at best–Smith’s performance is spectacular. He makes you believe he would actually be capable of surviving under these conditions. You feel his intense struggle with loneliness as he carries on conversations with both his dog and the mannequins he’s apparently placed throughout the DVD rental store he frequents. And his anger and frustration are real when he screeches through the city in his SUV mowing down rabid monsters. Smith’s facial expressions and body language are priceless. The movie makes you think you’re going to fly out of your seat, sometimes when it’s just for things like Neville barricading his house in preparation for the nightly stalking of the monsters, but that’s part of the fun. You never know when something’s going to jump out and attack him. Die-hard sci-fi thriller seekers would probably be disappointed in this film, but for the average movie-goer like me, you won’t regret seeing it. It’s definitely worth the $6.25 matinee price, and I’d even fork out $9.50 if I didn’t have to go home to an empty condo and try to go to sleep!